This postcard has a sharp image picturing an old girls camp of some type, maybe YWCA ??? Young girls dressed in Indian outfits sit on the ground. Tents are pitched in the background. Front of card reads "Camp Nepahwin , Canton , PA.". A super Bradford County PA related postcard image! Card back is divided and is postmarked, but I cannot read the date. Condition-Very good as shown with light corner wear. #679 Lancaster PA Tobacco Farm 1918 !!! This is a nice old postcard view! It pictures a large tobacco field with farm buildings in the distance. A farmer surveys his crop. The front reads "Tobacco Field Lancaster Pa.". A nice piece of tobacco memorabilia! Back of card is divided and is postmarked "Lancaster Pa Sep 3 1918" with a super American Flag cancel. Condition is very good with light edge / corner wear as shown. Here is a beauty! It pictures a Real Photo image of this roadside inn and restaurant. Front reads "The Blue Shutters, Route 611, Between Elmhurst and Moscow Pa.". Vintage 40s auto in view, sign reads "Blue Shutters Tourists Garage, Bar Service". Back is printed and reads "The Blue Shutters, known coast to coast, excellent food at all hours, home of the auto tourist, open all year round, your host to overnight guest and social functions, Phone Moscow 9016". Back is divided and is postally unused with no stamp box. Condition is near mint to mint! Another nice Penn RPPC image! 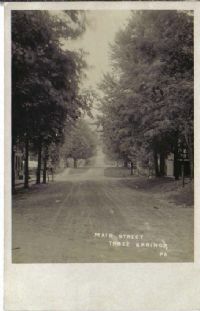 Shows rural Three Springs Pennsylvania and its Main Street. Visible are several businesses on this dirt road. A horse drawn delivery wagon is at left along with a buggy. Two children sit under a shady tree. Back is undivided and postally unused with no stamp box. Condition is excellent! Here is an interesting view! Boys or men stand outside an old brick storefront. The card reads "Junior Mechanic Building, Catasauqua Pa.". Back is divided and unused. Unknown date. Light corner wear. Here is a nice early one room school house view from Byerly PA ! It pictures a 1915 era view of the old school house on the hill. An outhouse stands out back. An early auto rattles along the old dirt road near the fork in the road. Front reads "Byerly's School House , Near Circleville PA". Back is divided and unused. Condition is very good. This early card pictures the large coal breaking operation at the Marvine Colliery. Back is divided and is postally unused. Card is printed "Scranton News Co., Scranton PA". Condition is mint. This is a super postcard! 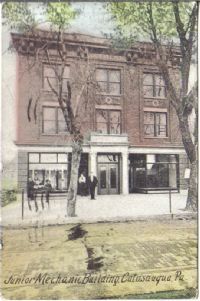 It is an original 1905 era postcard view. The card has a nice early image of an old brick building with ivy and arched doorway and windows. Out front, young girls and women in long dresses hold hands. Card front reads "Western Penna. Institution for Blind, Pittsburg, Pa.". Card back is divided and postmarked "Pittsburg PA Nov 23 1909". Condition-Good w/light corner wear as shown.